Ireland's government is to ban single use plastics from its government departments and public bodies. The move will stop the purchasing of single-use plastic cups, cutlery and straws for use within their offices. Richard Bruton, Ireland's Communications, Climate Action and Environment minister, will make the announcement later on Friday. The move comes after the European Parliament voted for an EU-wide ban on single-use plastics in October. The ban will come into effect from 2021, under the draft plans. The European Commission, the 28-nation EU's executive arm, proposed banning such items that it said accounted for 70% of the waste in oceans and on beaches. The commission proposed a ban in May, following a surge in public support, attributed to documentaries such as David Attenborough's BBC Blue Planet series. The UK will have to incorporate the rules into national law if the ban becomes a fully-fledged directive before the end of a Brexit transition period. 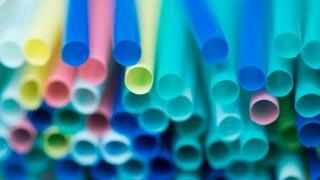 The list of banned items - such as cutlery and cotton buds - was chosen because there are readily available alternatives, such as paper straws and cardboard containers. MEPs also tacked on amendments to the plans for the filter on cigarettes, a plastic pollutant that is common litter on beaches. Cigarette makers will have to reduce the plastic by 50% by 2025 and 80% by 2030. Another ambitious target is to ensure 90% of all plastic drinks bottles are collected for recycling by 2025. Currently, bottles and their lids account for about 20% of all the sea plastic, said the European Parliament report. Those plastics have a huge impact on marine life. Fish and large aquatic mammals can be killed by the pollution. Whales can eat plastic bags, making it impossible for them to eat real food, which can eventually lead to death. When plastic debris breaks down from wear and tear, it does not decompose the way other products (like wood) do - but instead breaks down into smaller and smaller pieces, becoming "microplastic". These tiny fragments often end up in fish and can then be passed on to humans. Large volumes of plastic waste wash up on beaches, where it can be eaten by sea birds and other animals and kill them.